As I've confessed many times, I'm not exactly a coffee connoisseur. Or even a coffee appreciator. But when it's twenty cents a cup for my daily dose of caffeination, I say "Bring on the java!" Sonia's fine with this light roast too, because it's not only cheap, it's also ridiculously convenient to just pour the packet into hot water. There are no troubling mishaps with sugar bowls full of ants, annoying blunders with creamers that have been sitting in the fridge too long, or problematic incidents with unrinsed French presses. Just good, cheap coffee, ideal for travel. I give this product a respectable three and a half stars. Sonia will throw out four on this one. So here it is...the week between Christmas and New Year's. In my family's case, it's the week between Christmas with our own little family and Sandy's mom, and Christmas with my side of the family, which is celebrated with coffee by the tankard and food and treats out the wazoo. Not that I'm opposed...because I'm not...but by now I'm entering into about the fourth straight week of my kitchen shelves overflowing with cookies, and my refrigerator being stuffed with cakes and miscellaneous treats. With coworkers buying us pizza and homemade treats. With going out to restaurants like one of my local favorites when we're downtown seeing the holiday sights or out with friends. And soon in my sights is another weekend go-around with family and All. That. Food. Needless to say, I've gotten a wee bit pudgier. Those 10 p.m. solo mega cookie fests do catch up after a bit. Guess I oughtta try and eat healthier for a bit to return to normal....so granola! Granola is a great thing. Crunchy and sweet like a cookie, but healthier. 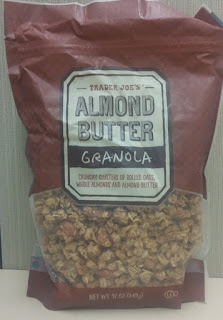 Still not all that wonderful, but it's a step back towards the good side, and with that in mind, I picked up Trader Joe's Almond Butter Granola. A couple years back, I was big into almond butter as a Paleo-friendly peanut butter option. I've eaten a lot of it, so I know what it should taste like, and could when paired with typical rolled oat granola...but it's not there. Not even remotely. 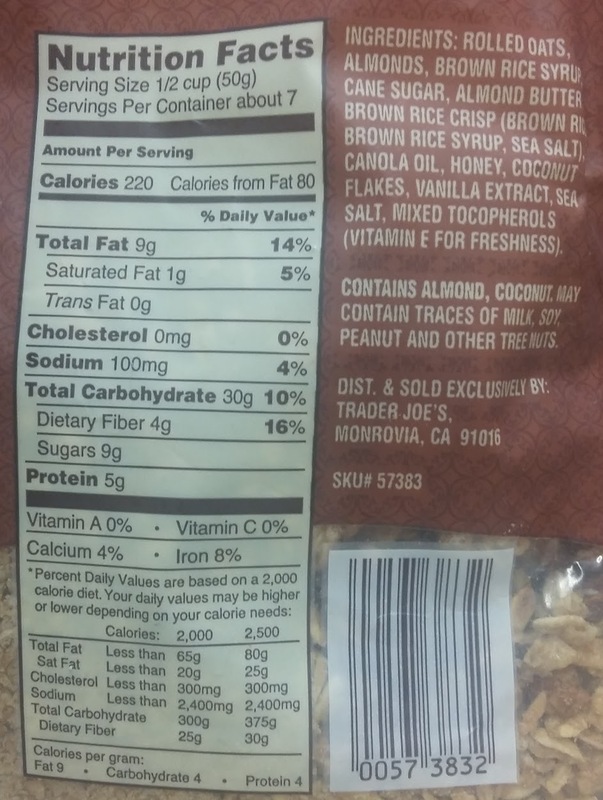 Well, okay, sure, there is an almondesque taste to the TJ's granola...but I'm thinking that's mainly due to the actual almond pieces in there, smattered about in usual style and ratio. There might be some almond butter mixed in with the mysterious brown rice syrup that serves as the epoxy for the big, crunchtacular bites...but mostly, I taste plain granola with a little extra nuttiness. For what it is, it's decent granola, but it could be better. A lot better. More almonds. More almond flavor. Maybe somehow incorporating the roasted, creamy goodness of decent almond butter. But this granola definitely fell a little short of expectations. I'll eat it, for sure, as work desk drawer snack standby, but I look at it more as hunger void filler, not a treat I'll be eagerly anticipating every day. Given all the junk i've had recently, though, that's probably a good thing. Flying solo on this review. Solid crunch, okay taste, not almond buttery enough. This has "meh" written all over it. So "meh" it is. Ever hear of the Mochi Rice Nuggets? No, not like the band on the packaging of Trader Joe's Presents The Crispy Crunchy Mochi Rice Nuggets. I mean, that's a pretty ridiculous name...though I wouldn't be surprised if a band named that actually existed. There's bands with names like Neutral Milk Hotel, after all. I kinda would want to hear this nugget band though. I bet they could do a killer rendition of "Billie Jean" - you see that bassist with the 'stache and mane? He'd rock that bassline. And I will reward mega Internet points to anyone who can translate what the word bubbles are saying - I assume it's Japanese, because the nuggets are a Japanese product. But you tell me. Nor are these particular rice nuggets particularly rock-like. Rocks, like stones (and not the Stones). Sandy and I neglected to get a pic of them out of the package, but they do closely resemble the non-cartoony aspects of the bag front - bite sized chunks of rice-type substance. Made from the same kind of glutinous rice paste as most other mochi, these mochi nuggets are crispified and fried. in a way - and this is meant as a compliment - they're more spongelike then the last product I reviewed, its name notwithstanding. Except instead of chewy, it's decidedly more crispy and crunchy while still retaining a slightly springy feel. Add in a little greasy comfort, and it's addictive. The first time I bit into a nugget, the taste immediately reminded me of something familiar....something distinctive....something I haven't had in a long time. But I couldn't figure out what it was. Crispy, a little oily, definitely salty, with a grain kinda feel to it...ah, there it is. Bugles. 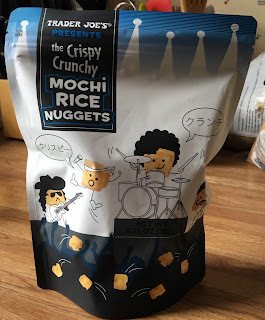 Yes, the mochi rice nuggets taste almost just like Bugles, except in a form you can't easily stick on the end of your finger. And yes, I know Bugles are corn based, while these are rice...but the taste is very similar, and it's not just me saying it. One of Sandy's friends tried a few, and unpromptedly said the exact same thing. It's like each nugget was a handful of Bugles that got compacted down into a snackable cube-esque form. 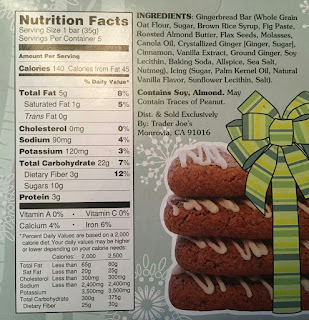 It is worth mentioning that the nuggets are not labeled as gluten-free - according to the back, there's a chance of cross contamination with wheat. And also, of all things...mackerel. I don't even know how to say anything more than that. But there could be mackerel in your mochi. Seems perhaps some quality assurance could be better enforced at the factory, hmm? I like the nuggets quite a bit. So does Sandy, and our kids too. I'm really hoping these become a thing with some different flavors and varieties coming out. Black pepper would be killer. So would garlic and herb, or even something like cinnamon and sugar. As is, though, the nuggets seem like they'd pair with almost anything, so there's some versatility. At $2.99, they'll be staple in our house for sure. Another Princeton run? Nope. Sonia and I are in the South. And it's way easier to buy beer down here. Back in the Keystone State, you had to go to a specialized beer distributor to get your hands on cervezas. Our part of the Garden State wasn't much easier. No grocery stores carried the stuff—not even the happy Hawaiian-shirt-clad helpers at TJ's could sell you suds in South Jersey. Even Wilmington, DE was similarly prohibitionist. But my old stomping ground of Wilmington, NC had an especially alluring wooden shelf well-stocked with Trader Joe's brand bottles, including a "mix-a-six" option, where customers could try up to six different craft beers in one cardboard case, paying à la carte prices for each bottle—most of which were in the ballpark of one dollar each. Merry Christmas to me. 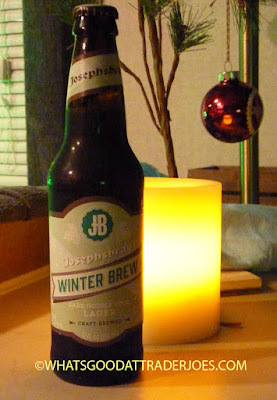 I guess Trader Joe's worked out a great deal with Gordon Biersch—they're mass producing all of the Josephsbrau label beers for TJ's stores. When I used to visit the Gordon Biersch restaurant chain during my time in L.A., I'd refer to it as "Gordon Beer-ish." As in, "That Gordon. He's such a beer-ish fellow, isn't he?" Quite beer-ish indeed, it turns out. This brew was the first one out of the fridge. 7.5% alcohol content, seasonally-appropriate, and a sleek, handsome label? Seemed like the logical choice. Now keep in mind, I've only broadened my horizons to dark beers in the past few years. But in that short amount of time, I've discovered what I like and what I don't like, and this beer was somewhere in the middle. It's got a nice deep brown color, and it pours with a small amount of suds on top. There's a molasses-esque sweetness about it, but it's still dark, malty, and very subtly spicy. 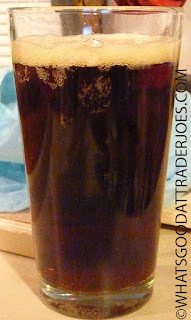 It's not super thick or heavy the way some dark beers can be—I'm not a fan of drinking motor oil. I still don't have my cicerone certification yet, but I'm working on it. When tasting new beers, I always make up my own mind about how I feel about them first, but I like to check BeerAdvocate after the fact to see just how far off I am from, you know...people who actually know what they're talking about. Seems these pseudo-beer-experts liked this brew a bit more than I did in general, but user "HopsAreDaMan" in particular summed up my feelings about this beer when he said, "...although I would happily drink this beer if offered to me, I would not seek it out." ...and I'm getting tired of it. Candied out. That's not to say I won't eat more, because I know I will, but man, the end needs to be in sight. Please tell me it is. 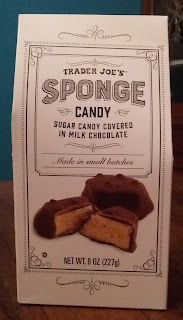 So, to be honest, I wasn't exactly anxious to try out Trader Joe's Sponge Candy. Yes, it's a thing, although I've never heard of it before. Don't judge me, I'm just sheltered. 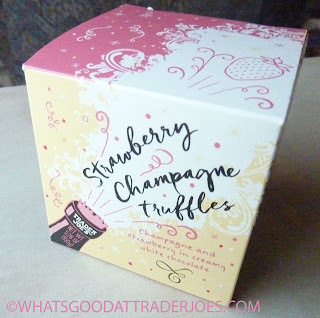 But the name kinda conjures up a kitchen sponge covered in chocolate....no thanks. Now a name like honeycomb toffee, I could go with that. 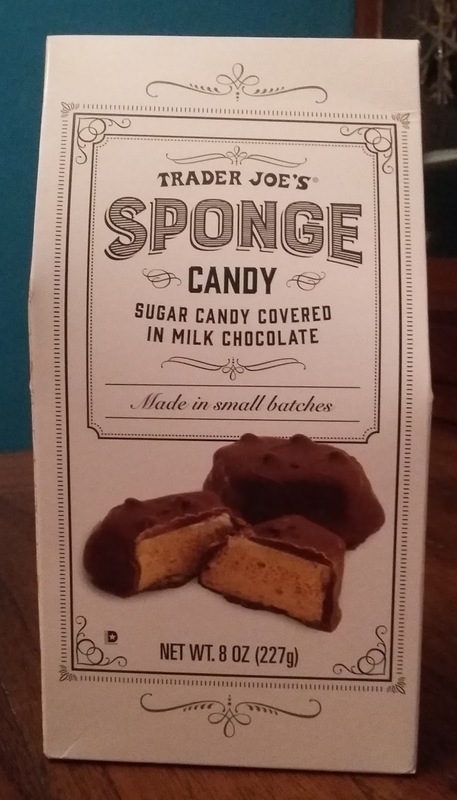 Regardless, does this TJ's candied sponge variant belong in your holiday candy plans? Ehhhhh....maybe. I took a couple bites, and maybe I'm candyworn and jaded, but it's not that great. Not bad either. Inside the box there's a plastic baggie all filled with various sized chunks ranging from a mousey morsel to a two or three biter. Inside, they're all much the same: a thin coat of reasonably decent milk chocolate, and a light, airy, crispy yet rigid chunk of toffee-like substance. The sponge candy. It's an apt name, seeing as all the little air pockets and layers do visually resemble a sponge. The texture is kinda interesting - think maltball mixed with a wafer, except much lighter - but it's neither compelling nor offputting. The taste itself is, as I said, fairly toffee-esque except a little scaled back. It does make a neat little bite, but after one or two, I've had enough. Both Sandy and I aren't swayed much one way or another. At least I can say I've eaten sponge candy and no, it has nothing to with Spongebob. A couple bites, and a shrug each. Cost only $3.49 for the package, so seems reasonable enough, in case you really actually needed any more candy. You probably don't. But there's a chance you'll like this stuff anyways. I don't remember how much we paid for this tub of delight, but I'm pretty sure it was under five bucks. And considering the high volume of merry little cookies they jammed into this one transparent package, I'd definitely add it to our list of "Best TJ's Items That Come In Plastic Tubs." 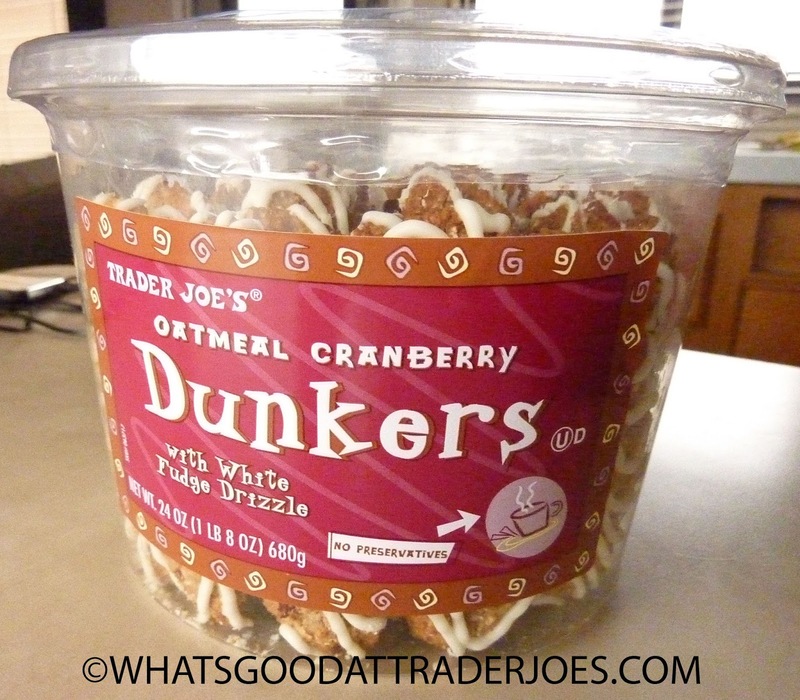 Sonia thinks they taste "like something Grandma might make around the holidays." There is definitely something homey about them—a very wholesome oatmeal flavor. But they're optimized for dunking—which means they're super crispy, crunchy, and firm, and they maintain their structural integrity even after being submerged in piping hot coffee or hot chocolate. They soften somewhat after being dunked, and their texture becomes even more pleasant. The oatmeal gets supple and warm, and the drizzle melts into something akin to fresh creamy icing from a bakery. I didn't mind these cookies by themselves, but even I, as someone who's definitely not in love with coffee, preferred them with a little java rather than plain. I haven't tried it yet, but I'd bet they're pretty decent with just a glass of plain old milk. I wish the cranberry flavor were just a little more potent. It's there, but not very pronounced. 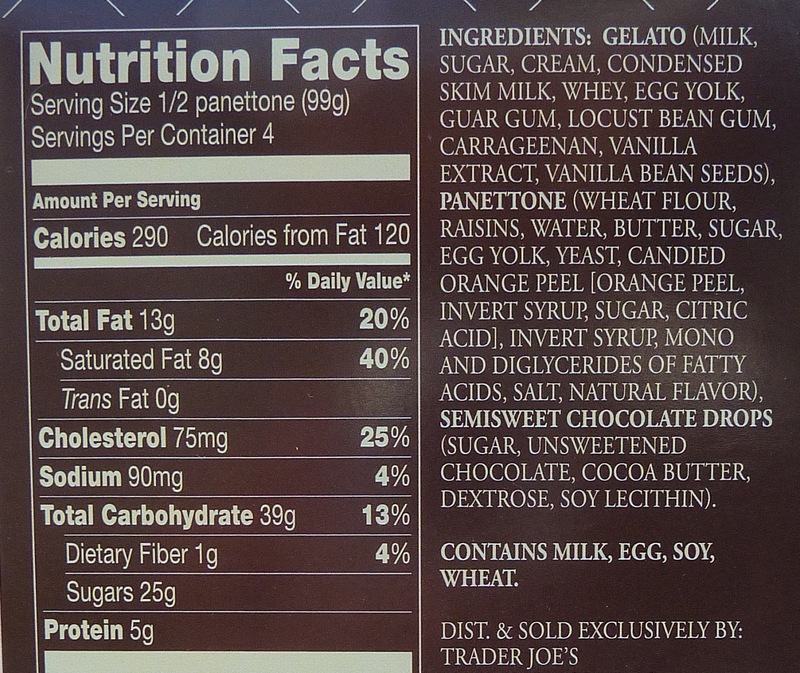 And I'd also like to add: HOORAY for white chocolate/fudge! Call me unsophisticated or whatever, but these just wouldn't be as good with dark or milk chocolate drizzle. Sonia and I will both go with four stars on this one. Years ago, in enough time passed that I can't recall what traces of logic I employed in deciding to do so, I invested about $5 at Bed, Bath, and Beyond on a universal TV remote. Not bad in the right circumstances, right? Well...this wasn't just any TV remote. The thing was freakin ginormous. Absurdly large. I don't recall the exact dimensions, but it was at least six inces wide, over a foot long (probably longer, and at least an inch thick. Each button was big enough that I could danced on top of them. Tom Hanks playing "Chopsticks" in the movie Big style, every time I wanted to change the channel. It took up half our coffee table. I guess I thought it was funny or cool or ironic or just dumb enough...I mean, it worked, but the novelty factor quickly wore off, and I ended up pitching it. I'm pretty sure Sandy shook her hood the entire time we had it, wondering what the h-e-double bendistraw I was thinking. 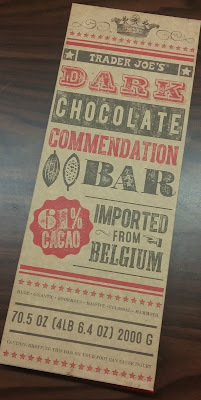 I forgot all about that until we bought Trader Joe's Dark Chocolate Commendation Bar. Don't rush to get too judgy. I suppose it's possible that Sandy and I could eat two kilograms of chocolate all by ourselves. Then again, it's also possible that I am the king of France. Possible? Yes. Probable? No freakin' way. But we hostd our annual holiday Cookie Potluck over this past weekend, and I figured, let's drop the $14.99 on it, we'll have enough guests, it'll be a cool thing to have on our table. In a pinch, we could use it as our table. My pics don't do it justice. It's...just really ridiculously big. Should have really busted out the measuring tape, or found a VW Bug to use as a size reference. Couple feet long, About a foot wide. Over an inch thick. That pic over there? That's just half. It's way too unwieldy to even bust off a piece with your hands. I'm not sure I wanted to risk busting a kitchen knife. What you really need is a rock chisel, or a large sanitized flathead screwdriver and a mallet. With a complete lack of better options, I ended using the prong from our knife block to randomly stab and chip off some pieces. Unless you're making an actual house out of gingerbread and you need shingles, there's no practical use for a bar this big. I totally get the appeal - larger than life chocolate bar, anti-Zoolander by its very existence - but once the novelty wears off, it's just chocolate. A lot of chocolate. Dos kilos. Whispering that in a Spanish accent makes it sound even more intimidating. Apart from the size issues, it's pretty decent chocolate, though. 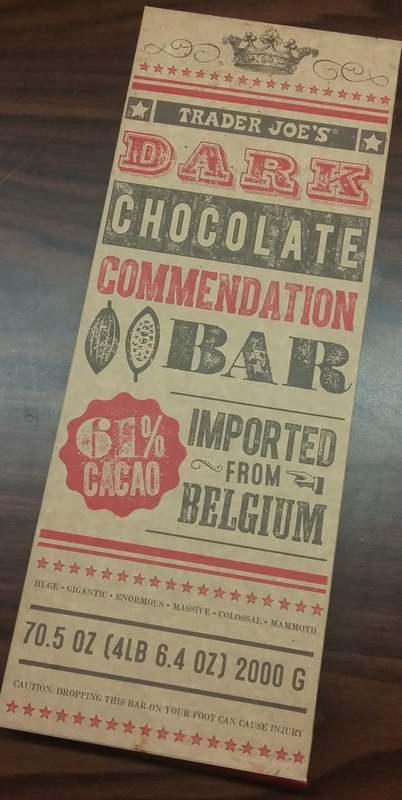 Earthy, bittersweet, but with a hint of creaminess - those Belgians got chocolate down to a science. It's not earth-shattering by any stretch, but good and solid, and I guess if I had to eat 4.4 pounds of something, there'd be far worse options out there. Dat size tho....it's too big. Over the course of several hours, me and a few dozen of our party guests chiseled away not even a quarter of the bar. If it weren't as thick, it'd go down easier. Personally, for a still really huge bar, I'd make it the same length and width but make it half as thick, and charge something like $8 or $9 for it. That's still an outstanding value, and makes it more likely the whole bar would be consumed. Both Sandy and I like it, but considered returning it just because there's too much left. I ended up taking it into work where we'll use it as emergency rations in case we all get snowed in. Maybe there are some practical options for something this large. Maybe there's some really fun ones. Those are up to you letting us know in the comments below. Darn good chocolate, too darn big. Caveat emptor. I have no idea how to accurately and fairly grade this, but something around a "not bad" sounds right, all things considered. 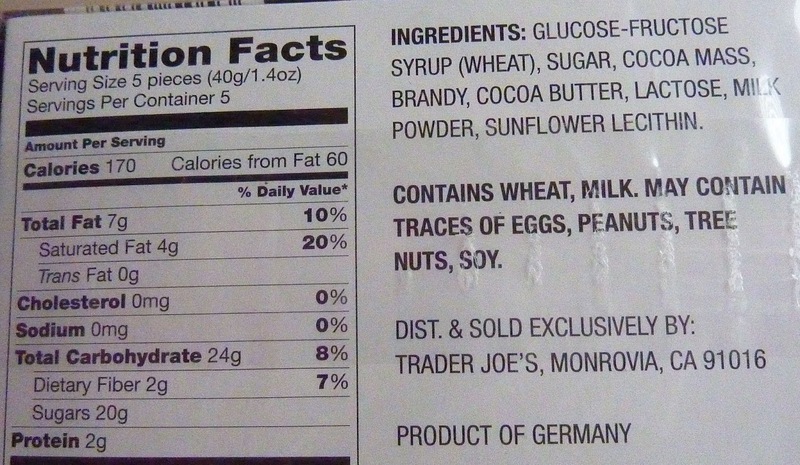 Prior to picking up this product, I had never even heard of brandy beans. If I had been asked what brandy beans were, I probably would have pulled something out of my backside along the lines of "Brandy beans are the beans used in the brewing process and fermentation of American brandy," trying to sound erudite and edumacated. And most of you would have believed me. Sorry, I guess that could be construed as an insult. Some of you would have believed me. Maybe. Are these even a holiday item? They were released (or re-released?) at exactly the same time as a million other holiday-related items, so I guess they are. I guess getting blitzed on brandy is sort of a holiday-ish thing to do—or at least a holiday party-ish thing to do. 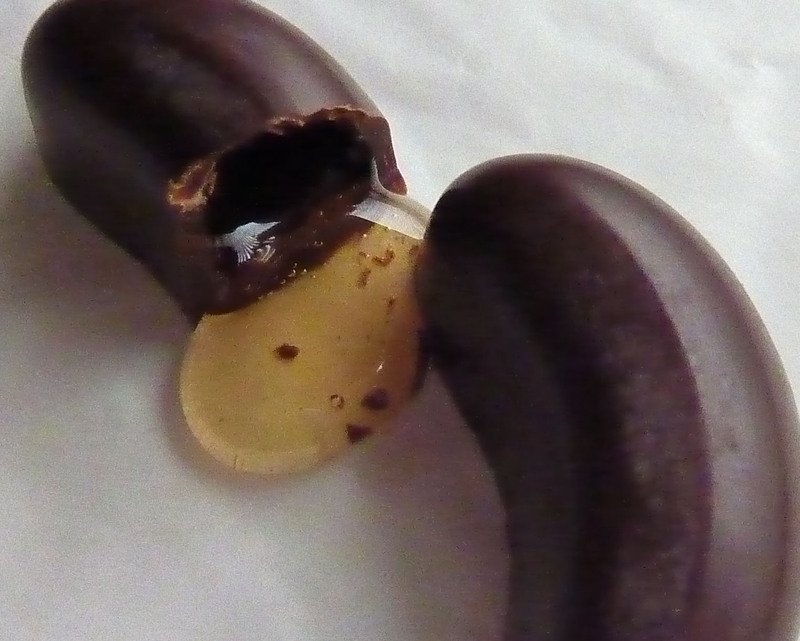 Unfortunately—er, I mean fortunately, you can't get crunk off of these little brandy beans alone. You need to pair them with actual brandy in order to achieve that effect—even though there is a bit of real brandy in each bean. There's a fascinating spiel on the back of the box indicating "sale of this product to persons under the legal age for purchasing alcoholic beverages is unlawful." Wow. I certainly didn't even get a buzz from the product's 4.9% alcohol content, but maybe the youngsters could if they ate the whole box. Because again, these chocolates are actually filled with real brandy. And it tastes like brandy, but thicker and much sweeter. The brandy filling almost has the consistency of maple syrup or honey. Somehow, it works with the chocolate. 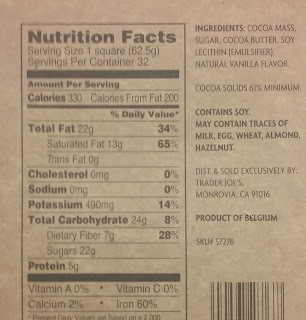 The packaging doesn't specify that it's "dark chocolate," but it certainly seems darker than your average milk chocolate to me. The moderate bitterness of the chocolate helps offset the sticky sweetness of the liquid center. It's a nice combo, and one that I've never had before. Sonia reacted similarly: pleased, but not blown away. If brandy and chocolate is your thing, then you're probably more qualified to review these than I am, and we'd love to hear from you in the comments below. Double 3.5's from Sonia and I. There's a certain allure to places like Coldstone Creamery, or the local frozen yogurt place where you can put in all your own mix-ins, isn't there? It feels like an ice cream laboratory, where you, the Dessert Doctor, concoct your own blend of all sorts of various ingredients then devour it all. It's cool. You're in control. You know what you're doing. You're going to make the Best. Ice Cream. Ever. It's going to be amazing, and all yours. Well, maybe that's your experience. Must be a lot of peoples', otherwise they wouldn't be so popular. But it isn't mine. Now, I'm a guy who likes chunky, wacky, jumbled frozen deliciousness as much as anyone else - I've been to the Ben & Jerry's mothership in Vermont literally about 100 times, and wondering when I'll have my next chance - but it's not been my experience. I take what I feel would be an awesome mix, and instead the outcome seems less than the sum of its parts. Like I did something wrong. It's kinda like that with Trader Joe's Jingle Jangle Ice Cream. This oughtta be a slam dunk. 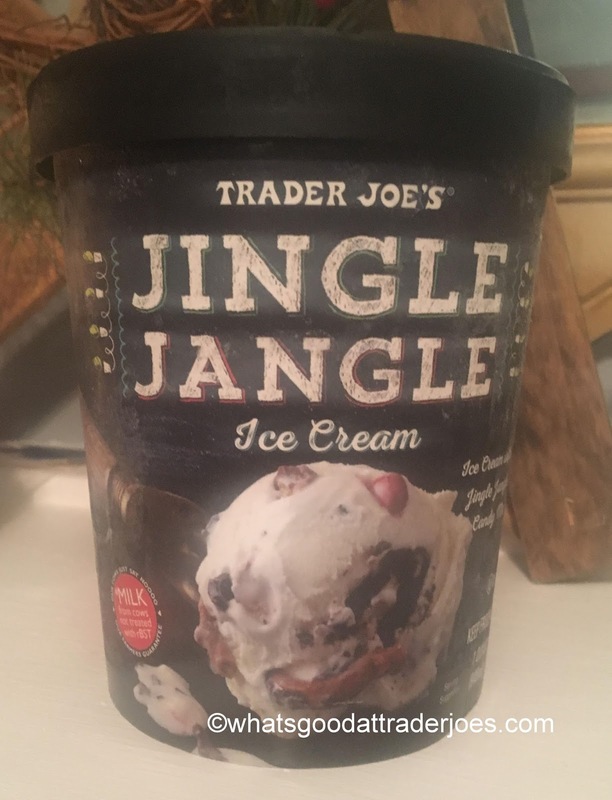 Take TJ's semi-popular Jingle Jangle and mix into vanilla ice cream! Sounds like an easy yum! Can't go wrong, can you? Well...it does. Where to start? Let's go with the vanilla base. Now, I have a deep appreciation for good vanilla ice cream, and TJ's happens to provide one of the better store varieties out there. This Jingle Jangle stuff must come from a different supplier, because it's so...non-descript. Run of the mill. The most boring of boring vanillas. It's white, milky, vaguely sugared, and cold, which while that can describe vanilla, it's not really vanilla. It's uninspired low premium filler at best. Not a big deal, you may think. That's why all the Jingle Jangle is in there....for flavor! That'll make up for it! Hate to say, but no, not really. I had to recheck our Jingle Jangle review to see what's even in it, because all I tasted was cold, hard chunks. 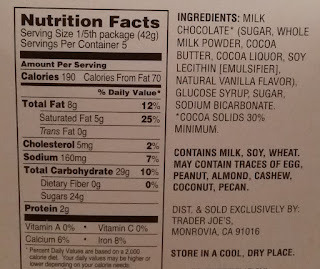 And that's even when my spoon came across something - there's not a whole lot mixed in. 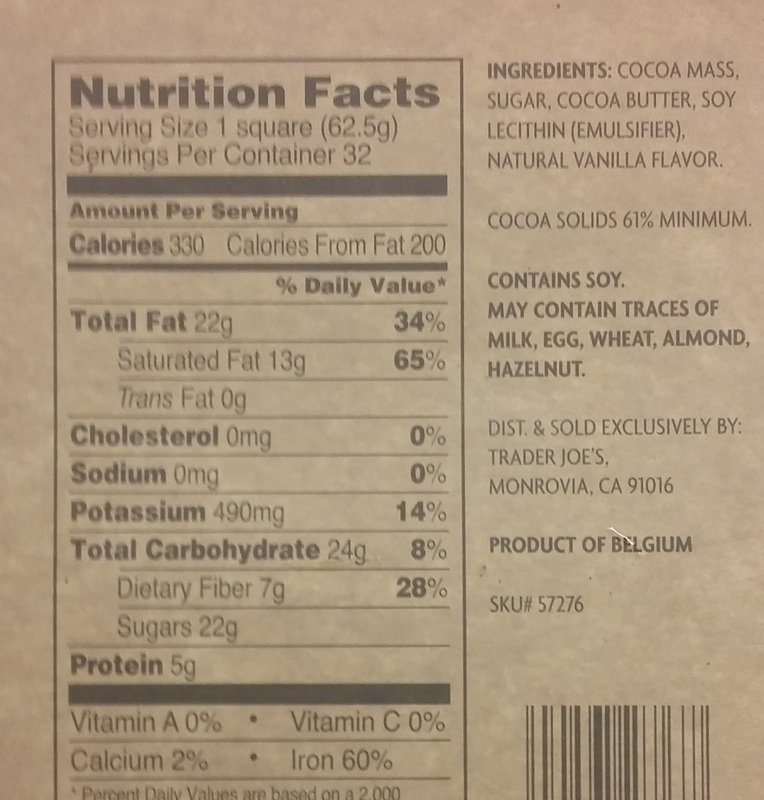 There's little specs of dark chocolate this and that everywhere. 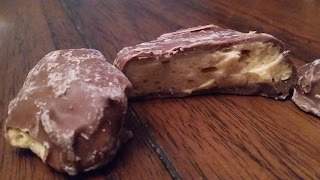 I spotted a couple busted peanut butter cups here and there, and was excited when I found a shard of choco-covered pretzel, only to be dismayed when I bit into it and discovered how soggy it felt. Major bummer. This ice cream is really rather ho-ho-ho hum. Now it's two seasonal products in a row I've reviewed that I've not overly liked. this time around it's not just me. Even Sandy didn't really enjoy it much either. The kids seemed to like it fine, which shows how easily content they are. I could really learn from that. Anyways, I'm not expecting to see this in our dessert mix again anytime soon. This item wants to be eaten like a cupcake. I mean, look at it. It's got "icing" on the top with mini chocolate chips instead of sprinkles, a body made of something bready and cakey, a liner/wrapper thing, plus a yummy creamy filling. On the other hand, when I eat things like this with my hands, I tend to look like a baby by the end of it. Some part of the pastry winds up on my fingers, my face...and often in my lap, and I'm sitting there helplessly flailing around trying to lick some of the dessert out of my goatee. Not that babies have goatees. And not that there's anything wrong with getting in touch with one's inner child—however, I'm not nearly as comfortable with wearing my food as most infants are. So I opted for the refined adult approach. I broke out a real metal fork and our finest dish (which happens to be made of plastic right now—don't ask). 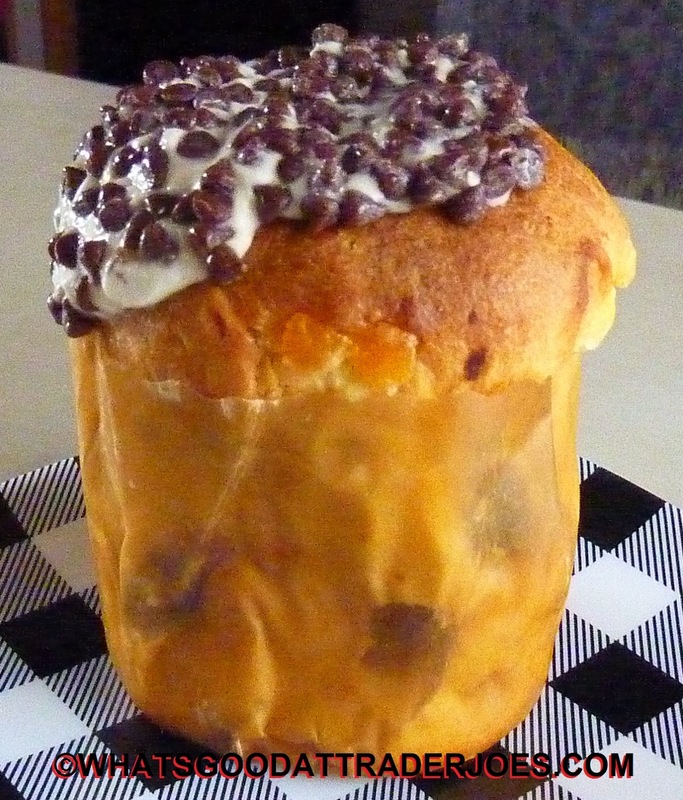 I set the thawed panettone in the middle of it, and dug right in. At first bite, I was mesmerized. Part of me wished I had opted to eat it with my hands so I could shovel it into my face faster. But then that seldom heard-from and even more seldom listened-to adult voice rang out in my head: "Slow down, my friend. This dessert wants to be relished and appreciated." 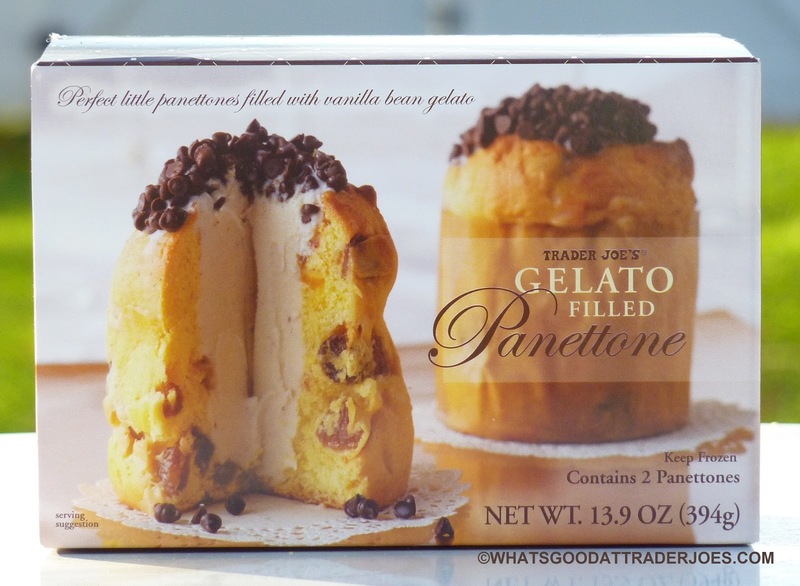 Because it's awesome—by far the best panettone we've had from TJ's. It's still the same fluffy, soft bread, and it still has some interesting dried fruits in it, but man oh man, that gelato is just amazing. It's both sweet and sophisticated—worthy of a top-notch Italian restaurant. 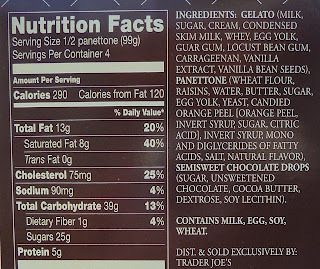 It's worth using a fork just so one can measure out equal parts of gelato, cake, dried fruit, and chocolate bits in each and every bite. Since the gelato is vanilla bean and there are lots of tasty chocolate drops, there's almost a cookies n' cream vibe about it. It's amazingly rich and creamy, and it blends together with the panettone bread and dried fruit much better than I would have guessed. There are pieces of candied orange peel, which I'm admittedly not a fan of just by themselves, but in this case they were so tiny that their texture was a complete non-issue. I thought they flaunted a poignant citrusy zing that really added something nice to the other elements. There were only a couple raisins, but they worked somehow, too. I could have sworn I saw a dried cranberry in there as well, but it may have just been a raisin with a sunburn or something. If you like good gelato and/or panettone, go ahead and pick this up and thank me later. It's one of the best desserts I've had in a while. Must be bear season at Trader Joe's. 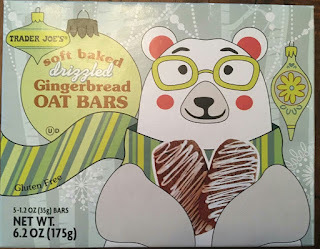 For the second time in scarcely over a week, here's another new, presumably seasonal product featuring a friendly, partially clothed bear offering some sort of treat. 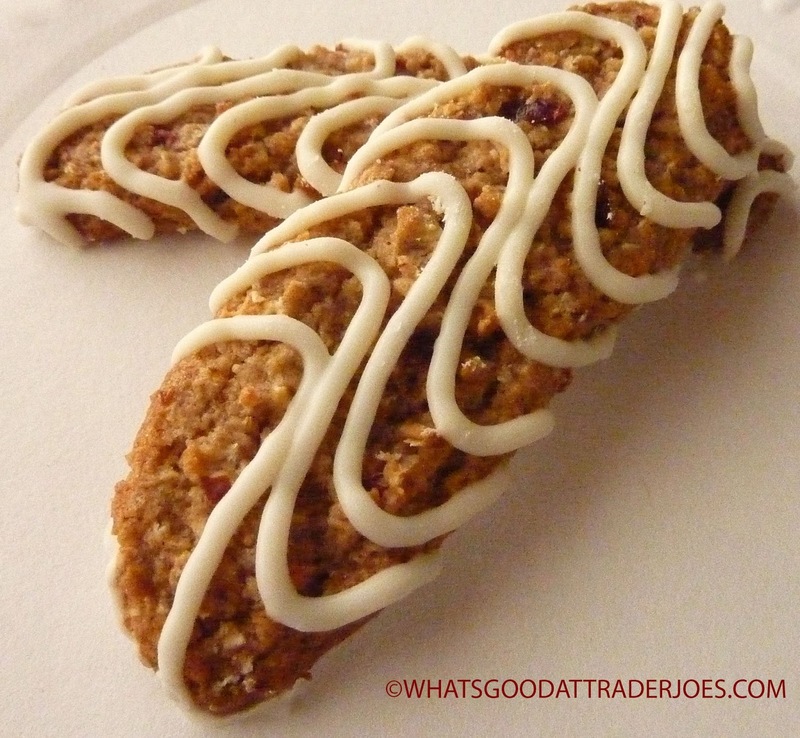 This time around it's Trader Joe's Soft Baked Drizzled Gingerbread Oat Bars. I mean, look at this bear - rosy cheeks, glasses, an ornament. Heck, (s)he's even holding a couple of the bars in a heart shape. I want this bear to be my friend. The fact (s)he's promoting a healthyish snack bar probably means I'm less likely to be eaten as well. But that's not all that's on the box front. 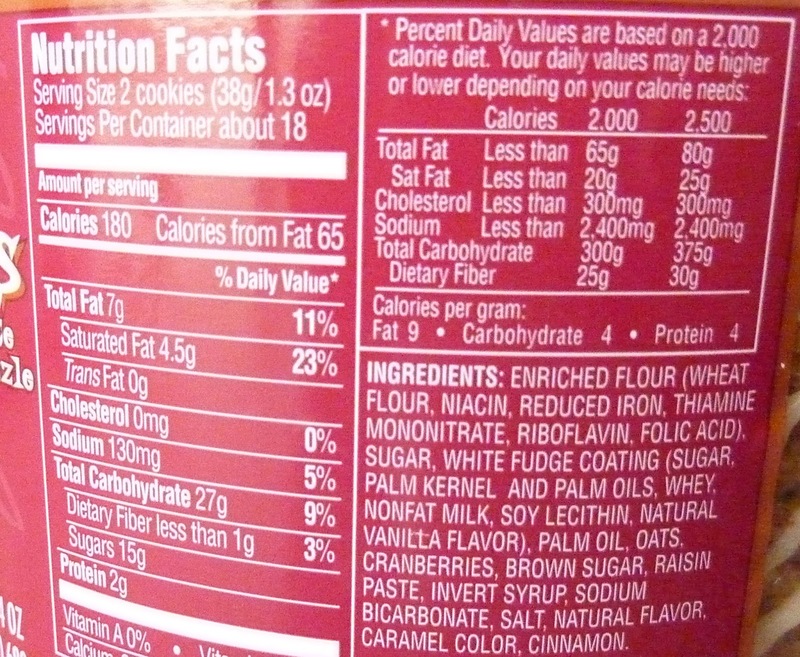 You'll have to look somewhat closely, but there's two, fairly often contradictory terms: "soft baked" and "gluten free." I'm not gluten-sensitive or anything by any stretch of the imagination, and I appreciate all the efforts that TJ makes to be celiac-friendly. 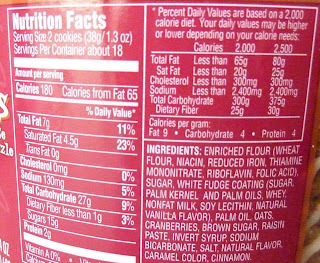 That being said, whenever trying any product that's sans gluten, more times than not, to me, the texture leaves something to be desired. 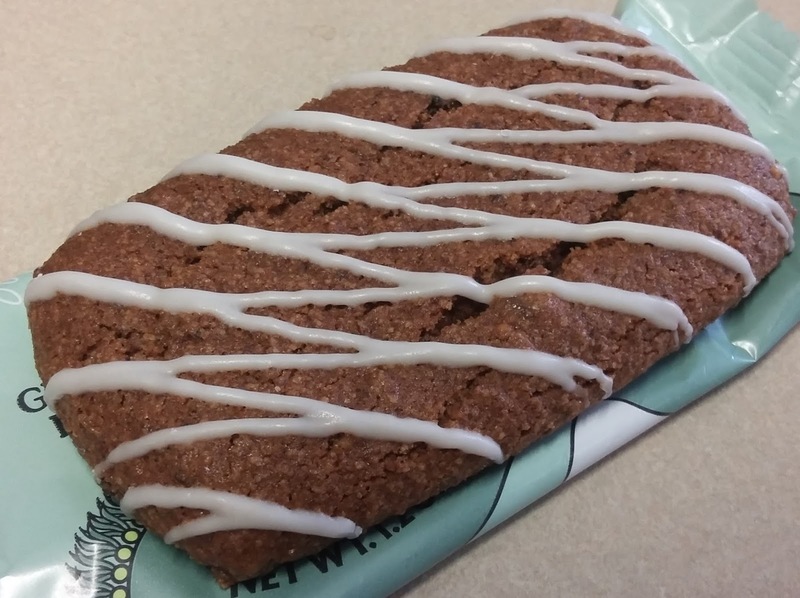 If this were truly a "soft baked" oat bar, it'd be quite a feat. 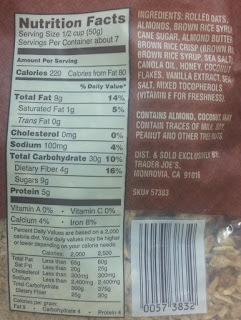 Unsurprisingly, the TJ's oat bars would not be what I'd describe as soft baked. Not at all. Dry, tough, and chewy? Yes, yes, and yes. It's a work out for the molars. 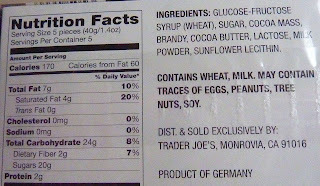 Take a look at the ingredients - oats, almond butter, fig paste - there's no way it wouldn't be otherwise. The bite feels like a cross between a semi-stale Nutrigrain bar and my grandmother's molasses cookies (which I like by the way, Grandma!) that would be less disappointing if not promising to be "soft baked". Aside from that, I like the bars quite a bit. Not a lot, if any of the almond butter or fig paste taste pop through - it's instead mostly oatty goodness with a heavy ginger bite. 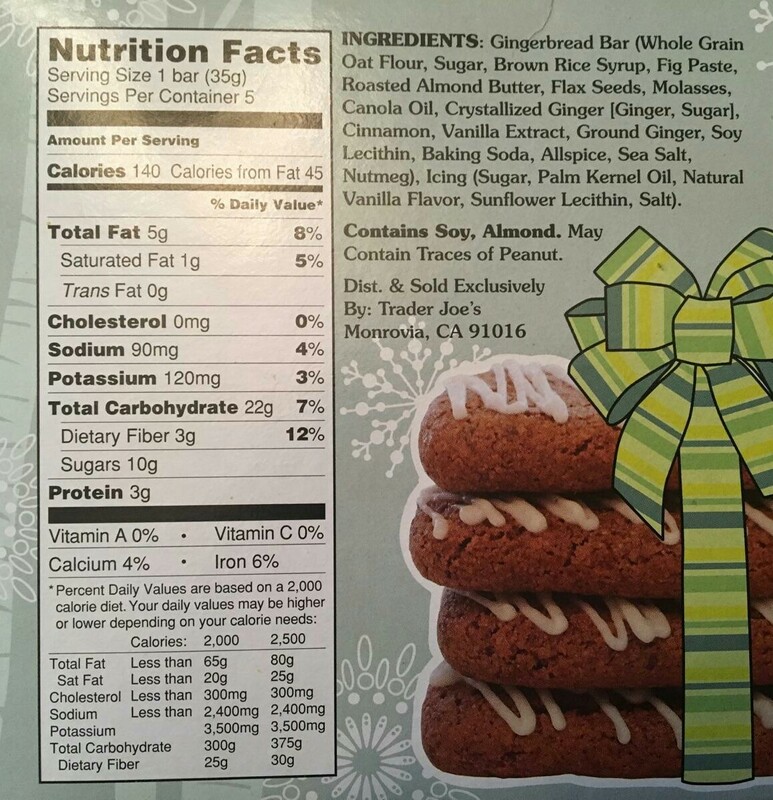 Seriously, the crystallized ginger in the bars are actually pretty close in potency to the Triple Ginger Snaps, so if a lot of ginger isn't your thing, stay the heck away. It's sugared over somewhat by the fair run-of-the-mill icing scratched over the top. I think my kids liked them - which is odd, because if it's not mac n cheese or ice cream it takes them 45 minutes of begging to have them eat - but I wouldn't be surprised if that's not the norm. 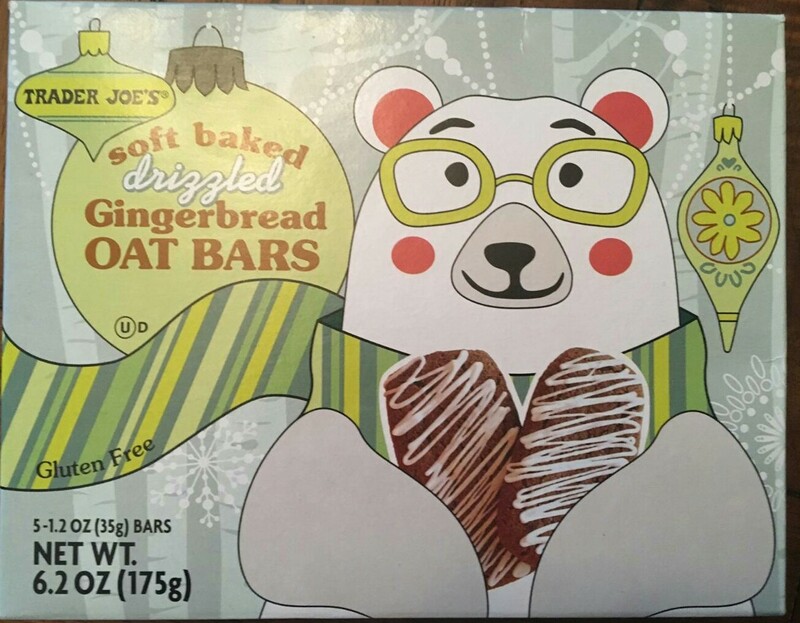 Between the chew factor for little teeth and the spicy ginger, it'd be hard to imagine them being a huge hit, cute polar bear be darned. 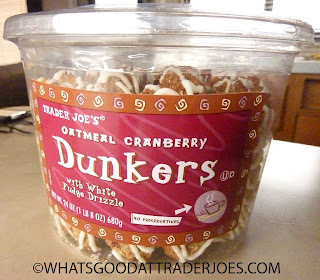 Anyways, for an on-the-go snack, or maybe even as a breakfast with an apple and coffee, you could do a lot worse. The price at $2.49 for a five piece box seems fair. Sandy didn't have much one way or another to say about them, so I'll assume that means a three. For me, I'll toss in a four - a lower score would be unfair to bear. Happy December, everyone! 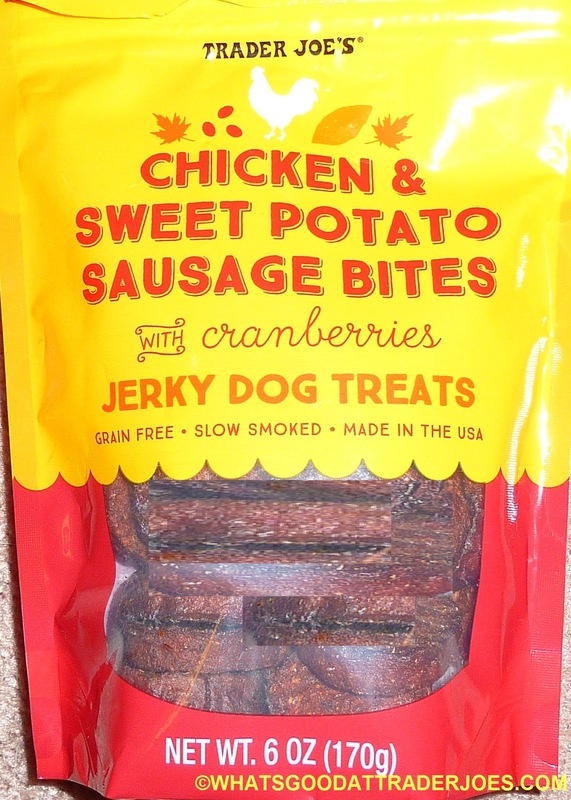 Alfred and Sadie have stepped in to give us another dog treat review. Is this even a holiday item? We're treating it as if it is. There are cranberries in there, after all. And what's more holiday-ish than a cranberry? These things smelled like the Wild King Salmon Jerky, much to the dogs' delight. How TJ's can make chicken and sweet potato smell like salmon, I'm not sure. Sonia thought they smelled like bacon. 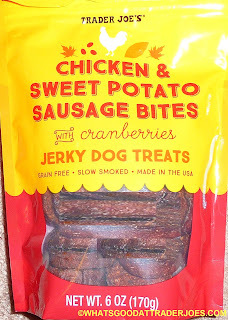 Maybe some kind of goofy rancid bacon, but hey—dogs love stuff that smells kinda funky. The video features antlered pets (Sadie better watch out she doesn't wind up in that Venison Burger!) ...as well as Sonia's take on the dog treats. They're still a little big and firm for our small dogs, but maybe not as bad as some of the treats we've seen in the past. Our dogs loved the taste.